Sunshine and clouds mixed. High around 60F. Winds N at 10 to 20 mph..
Sea lions sun along the Resurrection Bay shoreline. Sea kayaking is popular at Kenai Fjords Wilderness Lodge. A group of kayakers sets out for a guided all-day excursion. The main lodge of Kenai Fjords Wilderness Lodge overlooks Resurrection Bay on Alaska’s Kenai Peninsula. Kayaking near Fox Island. Most kayaks available for guided tours accommodate two people, so people of all abilities can join in. FOX ISLAND, Alaska • A torrential downpour lulled me to sleep the night before my all-day kayaking expedition in the waters around Fox Island off Alaska’s Kenai Peninsula. Through the cracked windows of my log cabin, I watched the waves slap the slate beach as rain pounded the roof. When I awoke, the storm had stopped. In its place, low fog clung moodily to the peaks on surrounding islands. All around, I saw shades of green and gray, and though the forecast was dubious, I packed my sunglasses. It was August, and I’m an optimist. A day kayaking under crystal-clear Alaskan skies had been a lifelong dream. I had come to southwestern Alaska with three friends to cap off the summer with an ocean adventure. We signed up for a multiday tour with Pursuit, an adventure travel company, and arrived in Anchorage with the storm clouds. At first (naively), I was surprised. Despite Alaska’s location in the verdant Pacific Northwest and its massive temperate rain forest, I somehow expected visibility and smooth sailing. I blame picture-perfect marketing and my glass-half-full attitude. Nevertheless, I learned an important lesson. When headed to Alaska, especially the coast, pack a durable raincoat, no matter what time of year you go. But the rain didn’t limit our experience. 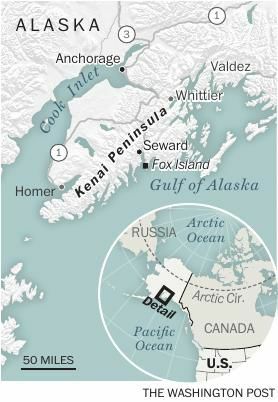 From Anchorage, we boarded the Alaska Railroad to Seward, a 4½-hour, 114-mile journey on the Coastal Classic. We sat in the double-decker GoldStar Dome car and had a full-service breakfast. It was the first time I’d enjoyed caribou sausage while traveling through old-growth forests and past glaciers. I hope it’s not the last. In Seward, we spent a night at the Windsong Lodge before boarding a boat for the 12-mile ride across Resurrection Bay to mountainous Fox Island, named for the fox-fur farming practiced around the turn of the 20th century. The farmers let the canines run free during the day and corralled them at night. I first learned of Fox Island when I came across “Wilderness: A Journal of Quiet Adventure in Alaska” by Rockwell Kent, an artist who retreated to the island in 1918 with his 9-year-old son. The book chronicles how artistic success had eluded Kent, who hoped to find inspiration by surviving an Alaskan island winter. The respite, though challenging — Kent and his son weatherproofed a goat shack and learned to forage — proved fruitful. Upon a return to New York, Kent’s career took off and he became known as a premier American graphic artist, printmaker and illustrator. Today’s Fox Island is more hospitable. Staff met us at the dock with umbrellas and shepherded us to the main lodge for a hearty lunch of stew and fresh bread. Afterward, my friends and I hiked through the thick, wet forest. A single path leads to a high point, and after a slippery few hours, we emerged breathless and soaked onto a ridge that probably affords stunning views when the air is not thick with rain clouds. But we each had a cozy waterfront cabin (the wilderness lodge has eight overnight accommodations) with piping hot water. Then we convened before the wood-burning stove in the intimate guesthouse and savored a glass of wine while scanning for sea otters through the floor-to-ceiling windows. 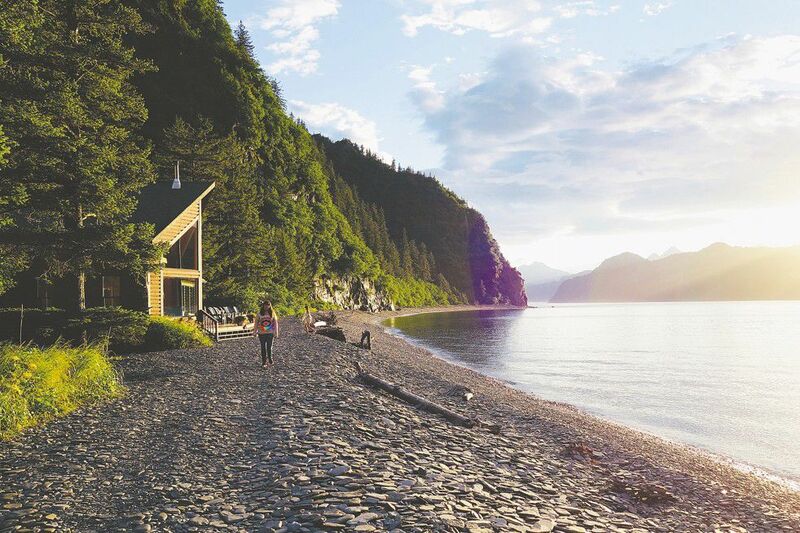 The Kenai Fjords Wilderness Lodge is a refuge where the pace is deliciously slow. No WiFi or phone service is available to guests, though there is a phone in case of emergencies. All overnight guests dine together on meals prepared by chef Landon Schoenefeld, a former star restaurateur who left his hard-charging life in the Twin Cities culinary scene after acknowledging depression and unhealthy habits. Minnesota’s loss is Alaska’s gain. After our first evening meal of fresh salmon, pureed turnips and a savory creative twist on fiddleheads and roasted asparagus, the simple elegance of the lodge made itself evident. The next morning, it was time to kayak. As the clouds threatened to open once more, I asked our guide, Danny: What would we do in case of rain? He laughed. As it turns out, Alaskans don’t take rain days. If they did, they would spend a lot of time waiting. Anyhow, he said, it’s preferable to kayak when it’s overcast or raining. Blue skies tend to bring high winds, a potentially problematic complication when you are your boat’s motor. And paddle we did, across Resurrection Bay toward an inlet called Humpy Cove. Danny promised us our destination would be scenic. The journey certainly was. We followed him past puffins and seals, bald eagles and rocky beaches, all made more dramatic by the ever-changing sky. Up the cove we went, spruce-lined slopes dropping into aquamarine water. We reached a narrow beach that sidled up to a weeping wall covered in vegetation. He pulled our kayaks ashore, and we excavated ourselves from the plastic hulls to admire the scenery. Around the corner of that wet wall was a massive waterfall. At least we “outsiders” found it so. To Alaskans, this cascade didn’t even warrant a name. Nameless or not, it was significant to the dozens of enormous salmon struggling upstream to spawn. On the cove’s banks, river otters piled on top of one another, quick, curious and cute. Then, as if to reward us, the clouds parted and a glimmer of sunlight slipped through. I wore my sunglasses on the paddle back to the lodge. The weather held, and the next day dawned cloudless for our boat tour of Kenai Fjords National Park. Nothing could have prepared me for the sensory stimulation of this six-hour adventure. Almost 40 glaciers flow from the Harding Icefield into the Kenai Fjord, and the best way to see them is from the sea. Humpback whales, orcas, sea lions, seals, otters, puffins and more thrive here, and as we navigated the ocean to Aialik Bay, wildlife viewings were abundant. I sat on the bow with several hearty travelers, the bracing wind at our faces, the crisp air keeping seasickness at bay. As we approached the Aialik Glacier, the captain slowed the boat to a crawl. Chunks of ice scattered throughout the sea, and we heard thunderous cracks as parts of the glacier broke off and dropped into the water, a natural process called calving. Established in 1980, Kenai Fjords National Park covers nearly 1,050 square miles in a stunning combination of jagged peaks, dense forests and receding and melting glaciers. Scientific studies have documented the impact of climate change on these glaciers. The melting rate has increased in recent decades, contributing to a rise in sea level. According to the National Park Service, from the mid-1990s to the early 2000s, the rate of glacial thinning in Alaska tripled compared with the period from the mid-1950s to the mid-1970s. The captain shared his encyclopedic knowledge of glaciology, climate change, wildlife and more, but so all-encompassing was the experience of witnessing the gigantic glacier up close that I left determined to do more research on my own.